As a previous reviewer says, this pub is now called the White Star. 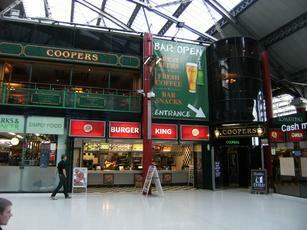 It's upstairs in Lime Street station and I finally decided to pay it a visit on Saturday. Keg options were Guinness, Stella, John Smiths Extra Cold, Strongbow, Guinness, Amstel, Fosters & Kronebourg. You can expect to pay almost £4 per pint for the pleasure of receiving your drink dispensed in a plastic glass. Not sure why they resort to this. Surprisingly popular. But I won't be returning. There are much better options within a few minutes walk of the station, even if you are unable to venture further afield. Vastly overpriced £1.75 for half of John Smiths smooth. If you have time, walk a few yards out of the station and get a better, cheaper drink anywhere. 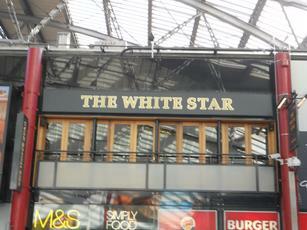 Now called The White Star. As can be seen from the picture it is a bog standard bog sitting over a Burger King on the concourse of Lime Street station. If you're desperate for a swift lager and to use the toliet prior to your train it's just about bearable.